An Inside Look at T.W. Hicks, Inc.’s Work at Lone Star Milk — T.W. Hicks Inc. Here at T.W. Hicks, Inc, we always talk about how we make sure we understand your unique situation, and telling you about our success at Lone Star Milk is one great way to highlight this! This project went so well, we actually won an award of “Project of the Year” (under “Industrial Floor Winner”) from Sikafloor. Sika is a leader in providing only the best materials—it was quite an honor! Through this installation at Lone Star Milk, we used various types of flooring systems (food-grade flooring systems) that fit the project. Although highly complex with flooring, walls, and ceiling projects (while making sure that it was all sanitary!! ), us here at T.W. Hicks, Inc. figured a way over all the obstacles. At the end of the day, we were able to create an amazing facility for all of the dairy farmers that are part of Lone Star Milk! An inside look at the Lone Star Milk project! Taking place in Canyon, Texas, those of us at T.W. Hicks, Inc. were excited to embark on this journey! Let us tell you, we were extra excited to drink milk after this important project, and we could not have been happier with the outcome. Lone Star Milk employs many dairy farmers from more states than just Texas (places like Louisiana and Kansas). They see trucks filled with milk coming in every day, they process millions of pounds of powdered milk each day, and are known to create roughly 3.5 billion pounds of milk each year! This project was important, and we knew that using Sikafloor was the only option for success. Sikafloor-19NA PurCem, where even under stress, these floors will not crack. Sikafloor 1610, which is used to not only protect, but restore concrete in heavy traffic areas. Sikafloor 264, a top-coat which protects against moisture. Sikafloor 315, which is used to also help create a barrier against moisture, and resist against wearing. 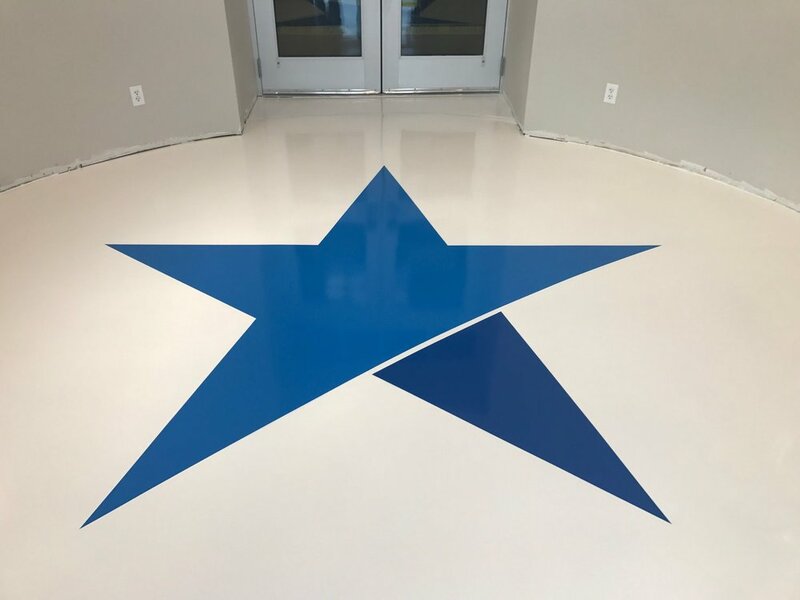 Through these different flooring systems, we helped create an amazing layout for our friends at Lone Star Milk! Lastly, as you can see in the picture below, the Lone Star Logo was necessary for this amazing project! This logo was crafted by one of our amazingly skilled technicians on-site! We really do have the best employees! An amazing tech for T.W. Hicks, Inc. made this on-site! No matter what your flooring needs are, T.W. Hicks, Inc. will be able to help you out by understanding your situation! We can’t wait to see what amazing projects we do in 2018!